NUMSA and NUM have joined hands to resist the government's move to privatize Eskom. 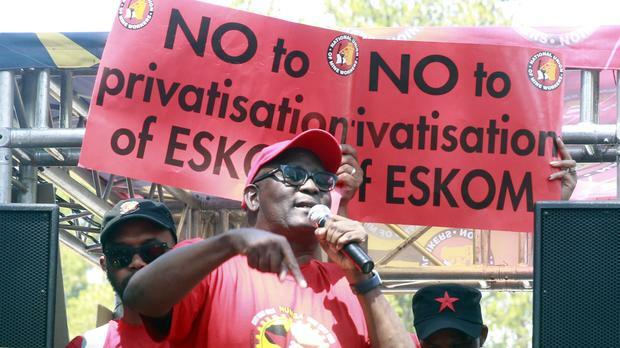 The working class unions in South Africa, including the National Union of Metalworkers of South Africa (NUMSA) and the National Union of Mineworkers (NUM), have been resisting the rampant privatization move of State-Owned Enterprises (SOEs) for months. One of the workers’ struggle was in the state energy enterprise, Eskom, for wage hike and against privatization. NUMSA claimed that the government was intentionally weakening Eskom to pave way for private corporate players. The two unions also opposed the Independent Power Producer (IPP) program. Under this plan, the government proposed to diversify power sources by making use of renewable energy produced by private, multinational companies. NUMSA clarified that they are in support of renewable energy, but opposed to the way the ANC (African National Congress) government is implementing it. Socialist Revolutionary Workers’ Party (SRWP), a new political party associated with NUMSA, vowed to take forward the struggle. Irvin Jim, general secretary of NUMSA and a member of the National Core of SRWP, writes about the struggle against the Cyril Ramaphosa-led South African government’s privatization move. The National Union of Metalworkers of South Africa has been fighting the ANC’s nefarious agenda to destroy and privatize Eskom and all other State-Owned Enterprises. This week, members of NUM and NUMSA staged a lunchtime picket at Eskom’s headquarters in Johannesburg, to protest against the looming retrenchments at the SOE, and to reject the Independent Power Producer program. In December, Eskom retrenched senior management staff. It embarked on this process without consulting unions and it is likely that job shedding will continue. The executive management team at Eskom, together with the ANC-led government who are shareholders, have failed to turn around the state of the SOE. They have looted it and brought it to the brink of collapse. They have now identified privatization as a way of covering up for their ineptitude and corruption. The recent ANC Lekgotla [meeting] recommend that Eskom be restructured and broken up into generation, transmission and distribution. In the name of ‘efficiency’, thousands of workers will be retrenched so that the politically connected capitalist elite of the ANC can continue to enrich themselves. One need only examine the Renewable Energy project endorsed by the government, the IPP program, for evidence of the state’s blatant disregard for the working class and the poor. Eskom’s own studies showed that if it continued with the project, it would lead to the closure of five power stations, and the loss of one hundred thousand jobs. The IPP agreements were signed without a social plan in place for the province of Mpumalanga, whose economy is almost entirely dependent on the existence of coal-fired power stations. This will deepen the crisis of unemployment and poverty in a country where the expanded unemployment rate is 37%, and more than half the population lives in abject poverty. We are convinced that the load shedding which took place late last year was an unnecessary ruse created to deepen the crisis in order to justify privatization. At 23% reserve margin, which is higher than the 19% required by the National Energy Regulator, there should have been no need for load shedding. The leadership of Eskom has absolutely no idea how to run Eskom and its power stations and their ineptitude is the reason we are subjected to systematic blackouts, euphemistically called “loadshedding”. Businesses have shut down because of blackouts and it has cost the country billions in revenue and in jobs which we will never recover. In 2008, Eskom was mired in a scandal when it emerged that some of its executives personally benefited from these blackouts through the increased cost of coal. The leadership of Eskom has a history of abusing this process for its own selfish benefit. The IPP project must be scrapped immediately, in favour of a just transition from fossil fuels to renewable energy. This transition must be driven by the working class, and the working class should benefit directly from any renewable energy project. The program must be state-owned and controlled for the benefit of society. History has shown us that privatization is not beneficial because it always leads to massive job cuts and because profit is the motive, it translates to higher costs for the consumer. More than two decades after the end of Apartheid, the majority of people continue to be denied access to electricity because it is too costly. We know that the future of the economy lies in the growth of the manufacturing sector, and in pursuing a job-led industrial strategy. The working class majority can never escape the shackles of inequality and poverty if we continue on this disastrous path. We cannot keep surrendering our power to the capitalist elite, and hoping for a different outcome. The Socialist Revolutionary Workers Party (SRWP) will put the working class first and will pursue an agenda in its interests. More than two decades of ANC capitalist rule has shown us that deviating from this has disastrous consequences. Hey Buddy!, I found this information for you: "Socialist Revolutionary Workers’ Party vows to resist South African government’s privatization move". Here is the website link: https://peoplesdispatch.org/2019/01/29/socialist-revolutionary-workers-party-vows-to-resist-south-african-governments-privatization-move/. Thank you.